Reading a good book is a great way to pass the time, and this hobby can also be enjoyed as a group. Starting a book club is an excellent way for seniors to meet like-minded people and discuss complex ideas. Here are a few reasons your senior loved one might benefit from meeting other reading enthusiasts. With age, it can become difficult for the mind to recall past events and process complex thoughts and situations. Activities such as reading help seniors challenge their mental abilities and reduce the risk of developing Alzheimer’s disease and other forms of dementia. Reading books regularly can also enhance memory and slow cognitive decline. In Harrisburg, PA, dementia home care professionals are available around the clock to help seniors with memory-related conditions age in place safely and comfortably. At Home Care Assistance, we understand the needs of seniors with dementia and the unique challenges they face as the disease progresses. Socializing is important for seniors, and older adults who isolate themselves are at risk of depression and anxiety. Social isolation can also make seniors susceptible to several health conditions such as high blood pressure and obesity. Joining a book club gives them an opportunity to interact with peers who have similar interests and make new friends. 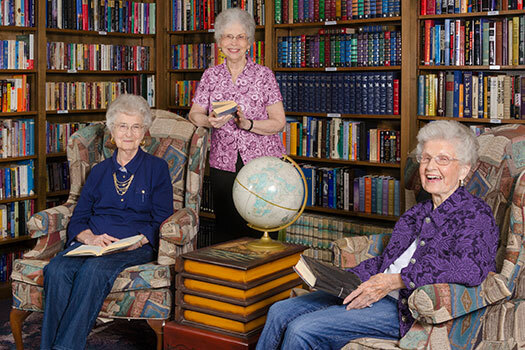 Reading with a book club encourages seniors to explain their views on the book to other club members, which can make them adept at articulating their thoughts. Being able to express their views clearly could help seniors in other areas of their lives, including personal relationships. Reading and discussing books with other book club members is a wonderful way for seniors to socialize, prevent isolation, and boost their cognitive health. For families living in Harrisburg, PA, respite care can be a wonderful solution when their aging loved ones need companionship and socialization a few hours a week or just need minor assistance with daily household tasks. At Home Care Assistance, we thrive on helping seniors maintain their independence while living in the comfort of home. Even the most enthusiastic readers often skim through the same books over and over again. While it’s nice to re-read a favorite book, it is also important to explore new thoughts and ideas. Most book clubs allow members to vote for new books every few weeks. While the members might not enjoy every single book they read, they will at least get a chance to learn about new genres and writing styles. Most book clubs provide some type of snacks during their meetings, which is a great reason for seniors to prepare healthy dishes. Many clubs even have themed snacks that are tied to whatever book they recently finished. Eating fresh and healthy foods helps seniors manage their weight, blood pressure, and blood sugar levels. Caring for a senior loved one can be challenging for families who don’t have expertise or professional training in home care, but this challenge doesn’t have to be faced alone. Family caregivers can turn to Harrisburg Home Care Assistance for the help they need. We provide high-quality live-in and respite care as well as comprehensive Alzheimer’s, dementia, stroke, and Parkinson’s care. To create a customized, high-quality senior care plan for your senior loved one, call one of our professional Care Managers at (717) 540-4663 today.